Democratic constitutions are unfit for purpose, with governments facing increased pressures from populists and distrust from citizens. The only way to truly solve these problems is through reform, argues Frank Vibert. He draws on his new book on the topic and sets out the ways in which constitutions should be revitalised. Democracies are struggling in many parts of the world. Explanations of why this is happening often focus on economics. The 2008 international financial crisis shook confidence in market economies. Job markets seem much less secure. In my new book ‘Making a 21st Century Constitution’ I put forward a different explanation. In my view, constitutions are the problem. The frameworks of bodies and rules they have established for democracies are now outdated in fundamental ways. They do not provide the support that democracies need in today’s world. There is a basic difference between these two types of explanation. If economics is the cause, then democratic discontents should disappear as economic recovery takes hold. If it is constitutions that are the problem, there will be continuing dysfunction. The discontents will not disappear until the framework of rules under which democracies operate are changed. In his last ‘State of the Union’ address, former President Obama stated that we should look critically at flaws in the system rather than at the flawed people it produces for political office. I agree. There is no generally accepted approach to constitutional analysis. But, since the time of the American Founding Fathers, assumptions about human behaviour and its imperfections have been central. The work of behavioural economists and social psychologists illuminates individual and group behaviour in three areas of great importance for the way in which we think about constitutions in today’s world. The first area relates to privacy. In today’s world we trade and exchange our privacy. We value privacy. At the same time, when we use our mobile phones and the internet we allow our identity to be authenticated and our behaviour to be predicted. We do so because of the sheer convenience we derive from the mobile and its apps. This world is very different from defining the private in terms of an inviolable physical space, such as an 18th–century homestead, or a 20th-century home. Yet it is this older conception of the private that underlies the idea of democratic consent to a constitution. According to this old concept we stand in our private space and give our consent to rules that define what is to be public and agree on the powers that are to be transferred to and belong in the public realm. There are two ways of reacting to this change. The first is to downgrade the importance of consent. The second is to place a new weight on bodies and rules that aim keep the basic importance of consent alive. Generally speaking, since the second half of the 20th century, both constitutional theory and practice have followed the first of these routes. The idea that we should give our consent has become less important than the idea that we should identify with the content of constitutions. We are invited to identify with their content by statements of aspirations and, above all, by lengthy recitals of rights. In my analysis I conclude by reaffirming the basic importance of consent. A second area where assumptions about human behaviour are crucial concerns modern day social diversity. Traditionally, deep social diversity has been seen in terms of minorities that need protection against a prevailing majority and where the minority or minorities could often be defined in territorial terms. However, in modern societies most of us encounter deep social diversity in shared urban settings, shared service provision and in shared work places. The social fabric of London is the prime example. Some people welcome social diversity and choose to live in cities such as London because of the stimulus they provide and for the innovation they can encourage. But social psychologists also warn about the defensive thinking and behaviour that individuals and groups can adopt when their established ways of viewing the world are challenged. Many of the crucial differences cut across ethnic and religious divides and are, for example, about attitudes towards the appropriate social roles of men and women, or about attitudes to authority. We expect constitutions to be able to encourage cooperative behaviour and social ‘togetherness’. The contemporary challenge is about how to achieve this in shared settings when all groups, regardless of size, may react defensively to defend their own values. In this context, my book discusses how constitutions can support democratic politics in playing a socially adaptive role so that people are prepared to modify their values in order to find an acceptable ‘better there’. I refer to this as a ‘transvaluational ‘role. It would be nice to believe that we are all reasonable people, with well-considered preferences and priorities, open to reasoned arguments and ready to be persuaded to change our views when presented with a well-reasoned argument. But social psychologists suggest that what we consider ‘reasonable’ depends on the context. Politics is about shortcut reasoning reflecting a world of information overload where we do not want to spend too much time on politics. It is associative reasoning. We pay attention to the views of those with whom we connect in our social world, including our social media connections. It is ‘diagnostic’ reasoning. We assume that what is good for our friends and associates is also good for us. We pay attention to the messenger, the person or group who brings me a viewpoint, without spending time on going into the detailed content or implications of what is being said. The drawbacks are that we pay attention mainly to the views of those we agree with and there is also a gulf established between the more deductive forms of reasoning essential in public policy making. An important task of a modern constitution is therefore to help make people more attentive to wider sources of information and views – the information from the social and natural sciences and the views of those with whom we do not agree. There are other features of the contemporary setting where the analysis in my book draws on institutional economics for insights. Two important areas concern the role of intermediaries and the role of benchmarking. In our world of information overload, we increasingly resort to benchmarks to guide our decision taking. We may choose schools for our kids based on the grading of inspectors, or a university based on nationally- or internationally-produced ratings, or choose a book on the basis of the awarding of prizes, or download music based on standings in charts we follow. In the book I analyse this increased reliance on benchmarking by looking at a sector where they have become increasingly pervasive – the financial sector. Benchmarking in constitutional terms takes the form of an ever-increasing reliance on declarations of rights. They direct our attention to what is most relevant in complex ethical choices. Unfortunately, as with other forms of benchmarking, they are subject to over-production, to the narrowing of claims, to manipulation, and to moral hazard. My book warns against the over-extension of the role of rights beyond mainly procedural rights. Over-reliance disguises the more difficult task of getting institutions correctly specified. In today’s world we expect markets to be responsive to our demands in very immediate ways. We are all familiar with the disruption to old forms of delivery in high street retailing, banking and other fields as we all order online. Institutional economics suggests that we need to look behind this directness of the marketplace in order to identify the intermediaries involved – the web service providers, the data collectors, distributers and processors, the payments and delivery systems. Much the same reliance on new intermediaries is occurring in non-market sectors such as in the provision of government services where specialist bodies are proliferating. However, we do not experience the growth of longer and more dispersed chains of specialist bodies in government in the form of a higher degree of democratic immediacy and responsiveness. On the contrary, each of the key attributes of democratic government – the broad inclusiveness it offers, the scope it gives for voter feedback to those with authority, and voter input into the formation of policy priorities – seem weakened rather than strengthened. Elites and those who know how to deal with the intermediaries seem to have gained advantage. One way of responding to this situation is to look at constitutions as chains of intermediation themselves. They provide for interventions at the beginning of the chain, where they can re-establish directness of communication, in the middle where they can provide for new types of representation, such as a body that scrutinises inter-generational fairness, and at the end of the chain where they can provide for oversight without being dependent, in the way constitutional courts are, on the referral of individual cases. Constitutional analysis seems a long way from the real world and a long way too from the noise of day-to-day politics. Yet we should care about constitutional design. Constitutional failure brings a human cost. Design has been following past models from past times. We are now in a different world. We need to rethink. This article gives the views of the author, not the position of Democratic Audit. It was first published on LSE’s British Politics and Policy blog. 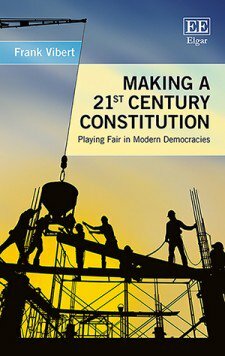 It draws on the author’s new book ‘Making a 21st Century Constitution: Playing Fair in Modern Democracies‘, published by Elgar in June 2018. Frank Vibert is Senior Visiting Fellow in the Dept. of Government LSE. He has been a Senior Advisor in the World Bank and Senior Visiting Fellow at UNU/WIDER in Helsinki. He was Director of the European Policy Forum, an independent Think Tank based in London, before coming to the LSE in 2008. He is the author of a number of books on regulatory and constitutional topics.